If our session proves to be any indicator, this little girl is going to walk well before she’s a year old, and will probably crawl some time next month. ;) Monroe (isn’t that a beautiful name?) was one of the most active and physically advanced babies we’ve done a session with at this age. We spent the first half of our session just holding her while she raised her head and looked around, kicking her little feet and waving her little arms and watching us with incredibly clear, focused eyes. It was really nice to be able to take our time with her and let her settle in to the session. After about an hour or so, and a little more milk from Mom, Monroe fell into a deep sleep and we were able to get those sweet sleeping baby shots Mom’s and Dad’s love so much. I’m pretty sure this will be the last quiet session for Monroe… after this, we’ll be chasing her all around the house and the yard for sure! 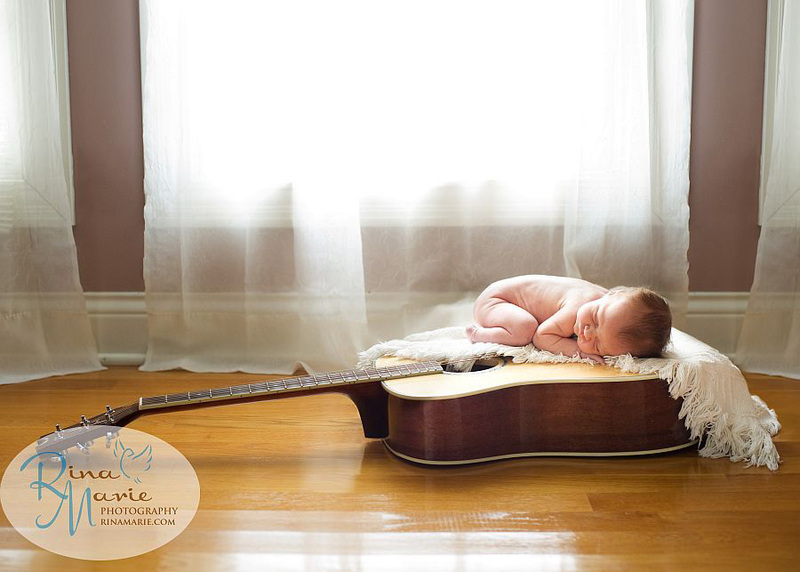 We’re getting a lot of requests lately for pictures of newborns with Mom or Dad’s guitar. I love that, it’s so great to be able to incorporate something special like this. This entry was posted in - PHOTOGRAPHY -, Newborns/Babies, Portfolio. Bookmark the permalink. These pics of Monroe are A-D-O-R-A-B-L-E and I love the one of her on the guitar. Beautiful photography and a beautiful baby!!! These pics are so sweet! And that baby, just darling! I LOVE THEM!!!!!! Can’t wait for the rest…how am I ever going to choose? So glad you’re happy with them, Lindsay! Don’t worry about choosing, that’s why we’ll come to you for the proofing session… so you can see them all in your home where you’ll be hanging them, and we can help you! I’m looking forward to showing you the rest, she’s such a beautiful baby! Love Love Love!!! So sweet! Gorgeous shots of a gorgeous little gal! They were absolutely adorable. Can’t wait to see more of your amazing work. Will let the girls at work know what beautiful pics you do. Have to say, you had a beautiful baby to work with. she is beautiful! WOW! Thanks for sharing! I love the pictures! Monroe is adorable. The photographer did a wonderful job, of course she had great material to work with. :-) excellent job! Absolutely precious! I love her expression in the one where she’s wearing the purple bloomers. Gorgeous pictures of a beautiful princess!!! What an angel! Monroe is such a beauty! 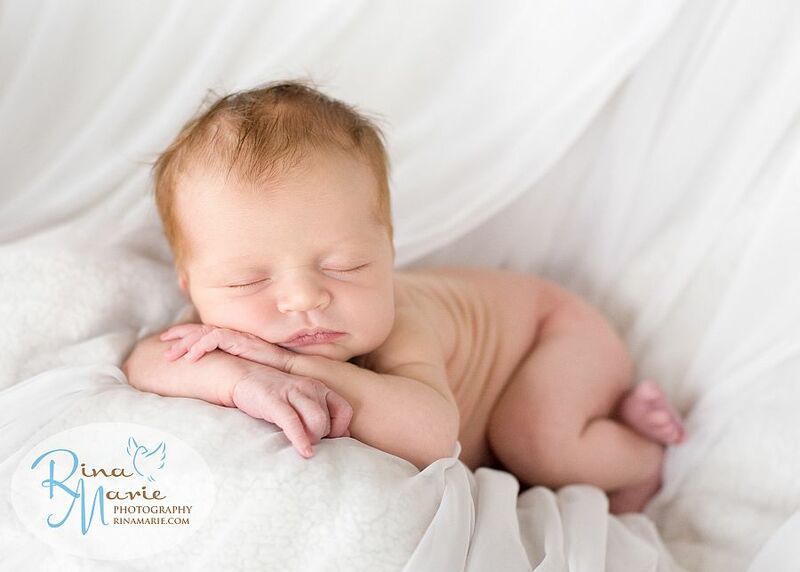 Love how her little hands are folded under her chin….just precious! So it seems that little Miss Monroe had planned to stay awake and help direct her first photoshoot! The pictures are gorgeous! She is absolutely beautiful. I love them all! Love those ruffle undie-roos!!! Monroe is a doll baby! I love the pictures, they are so precious and give her personality!! the vividness of the colors are beautiful. i love that her little hands are folded in one of them. Just perfect!! These are adorable, Lindsey, but some day she will probably say, Mom, I was naked!!! :) Love the fact that she slept in all of them. Mine never would do that!! I love them all it will be hard to choose Lindsey guess she just takes after her mom for looks but now as for sleeeping?? I think as I recall that is a different story! OH my goodness, love love love them! Love all these photos, and sleeping baby pictures are priceless! Sooooo sweet! Congratulations Lindsay! The photos are beautiful and Monroe truly is a sweet girl. The pictures are so beautiful. They are all precious. She’s precious!! Such great pics! What a BEAUTIFUL little girl!! Monroe has the perfect little bow lips. Love the purple ruffles—my favorite. The pictures are absolutely adorable, Monroe is just precious! Rina your photography is amazing, I love your work! Great job! She’s so precious! 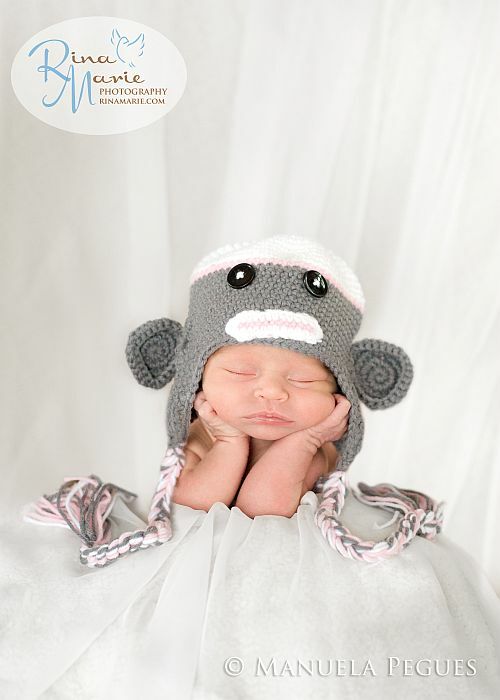 I love the crocheted sock monkey hat and the little purple ruffles. What beautiful pictures! I haven’t seen the guitar poses before. Monroe is so precious! What a perfect little girl. So beautiful! love the pictures. Wonderful photos of a sweet little angel! Pure perfection. So is gorgeous. She is def going to be a lil Lindsay. Miss you and again Congrats! These pictures are adorable. I’ll have to agree Lindsay, it will be hard to choose!!!! Very sweet. Great photography! I am in love. Just perfect. what beautiful pictures!! i love them!! Original and beautiful pics of a beautiful little girl! She is so beautiful! Love the choices of poses and outfits! BEAUTIFUL!!! I love the naked one of her! Cannot wait to do something similar with my little one when he comes. These pictures are great! She is so adorable!! The first one is my favorite…where she is propped up on her elbows…so sweet!! Congratulations!! It doesn’t get much cuter than that, she is adorable! SO PRECIOUS!! 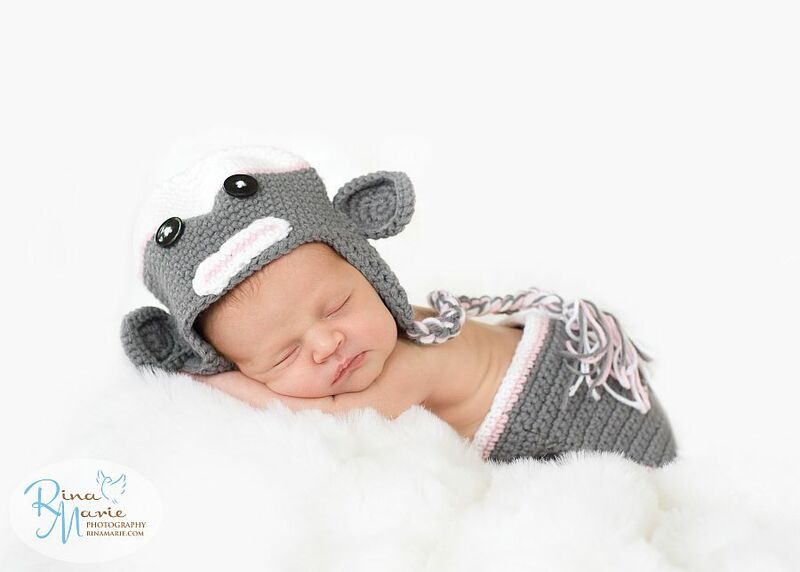 Loved the sleeping baby photos!! I have never seen such sweet pictures! She is such a beauty!!!!!! !